Originally published in, The PCB Design Magazine, November 2012 issue. 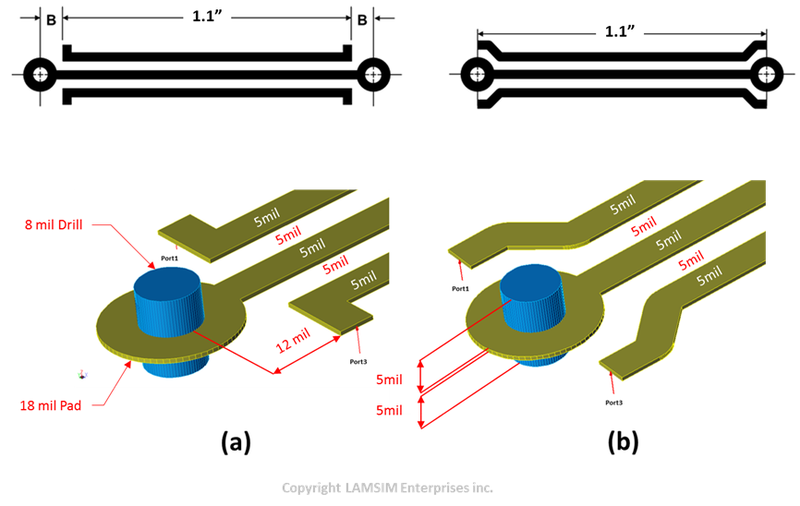 In normal PCB designs, crosstalk is usually an unwanted effect, due to electro-magnetic coupling, of two or more traces routed in close proximity to one another. We usually consider it to be our enemy, in any high-speed design, and go to great lengths to avoid it. So how, you may ask, can crosstalk ever be your friend? To answer that question, I would like to start out by taking you back to the fall of 1994. This was the era of wide parallel busses running up to 33 MHz across backplanes. High-speed serial, point-point interfaces, and serdes technology, as we know and love today, was just a twinkle in some bright young engineer’s eye. Nortel, a.k.a. Northern Telecom at the time, was looking to replace the computing module shelf of the DMS Supernode platform because it was projected to run out of steam a few years later. In order to address the issue, the system architects decided that a scalable, multi-processing, shared memory, computing architecture was needed to replace it. My job was to develop a concept to package all these cards in a shelf, and then design a backplane to interconnect everything. It quickly became evident that a single shared bus could not support the bandwidth required for multi-processing. 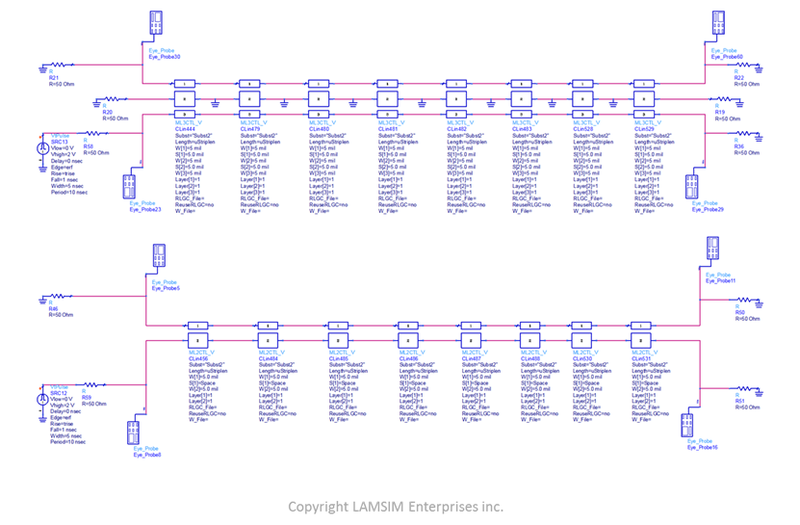 Nor could multiple parallel buses solve the problem, because of the lack of high-density backplane connector technology needed for all the I/O. Even if we had a suitable connector, and it could magically fit within the confines of the card slot, then the layer count of the backplane would have grown exponentially. No, something else was needed. Fortunately, Bell Northern Research (BNR), the R&D lab of Nortel where I was working at the time, had an advanced technology group, that liked to play in the sand. I remember going to a meeting one day to see some presentations on some of the neat technology they were playing with. One presentation they gave, was of a unique non-contact interconnect technology. I immediately saw the practical application that technology offered for our architecture, and it instantly became my friend. It allowed us to eventually invent a patented, proprietary point to multi-point interconnect solution, running at 1GB/s per pair . The non-contact technology actually relied on controlled electro-magnetic coupling, or simply crosstalk. See Figure 1. In this simple high-level block diagram, each card on the shelf would transmit their data differentially across the backplane. As the differential pairs traversed through the connector fields of the card slots, the transmit signal was edge-coupled to an adjacent small trace, about three quarters of an inch long, connected to the respective receiver pin. After the last card slot, the transmit differential pairs switched layers where they returned back to the originating card and were terminated. The beauty of this architecture was that each card only needed one set of transmitters to broadcast its data to all the other cards. 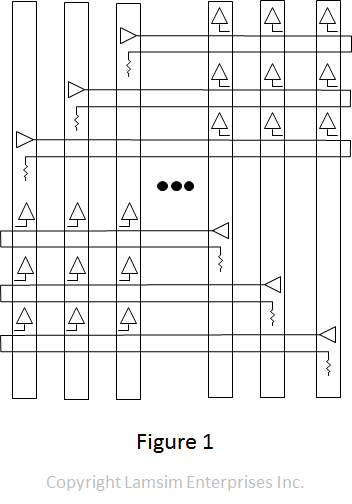 Since each card had enough receivers to listen to the other cards, the point to multi-point interconnect achieved the equivalent of a multipoint to multipoint architecture; but without the overhead of additional pins and PCB layers. Furthermore, an effective line rate of 1GB/s was achieved using simple, inexpensive 2mm connectors; the same ones chosen for compact PCI standard. Figure 2 is a photograph of an inner layer, double-sided core of the backplane, prior to lamination and drilling. It shows the couplers in more detail. The round pads are for the connector vias, and are used to attach the coupler traces to the connector pins. The rows of pads on the left are for one card slot, while the rows of pads on the right are for another card slot. 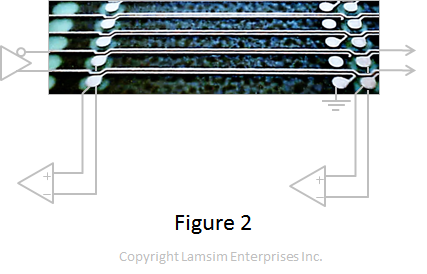 If we look at the two traces entering the picture from the bottom left side, we can see how they are routed through the connector field. These two traces are part of a differential pair where each are routed as single-ended traces, i.e. with no coupling to one another. As these traces approach the first row of pads, they jog down to minimum spacing to ensure close coupling to the coupler traces attached to the pads. The close spacing continues to ensure maximum coupling to the next set of pads, where the pattern stars all over again at the bottom right. This pattern repeats all the way up the photo for each differential pair. You may be astute to notice that the bottom coupler trace connects to a pad at each end, while the mate coupler, above it does not. When two, coplanar parallel traces are in close proximity to one another, there are two types of crosstalk generated; backward or Near-End crosstalk (NEXT); and forward or Far-End crosstalk (FEXT). As the transmit signal propagates, from left to right in the photo, the rising edge of the signal initiates NEXT at the beginning of the coupled length. The NEXT voltage saturates after a critical length equal to the risetime divided by twice the propagation delay; where the risetime is in seconds, and propagation delay is in seconds per unit length. It stays saturated for twice the time delay of the coupled length. Because of differential signalling, the NEXT voltages are of opposite phase on the respective couplers. At the coupler pin, there is a reflection caused by the via. 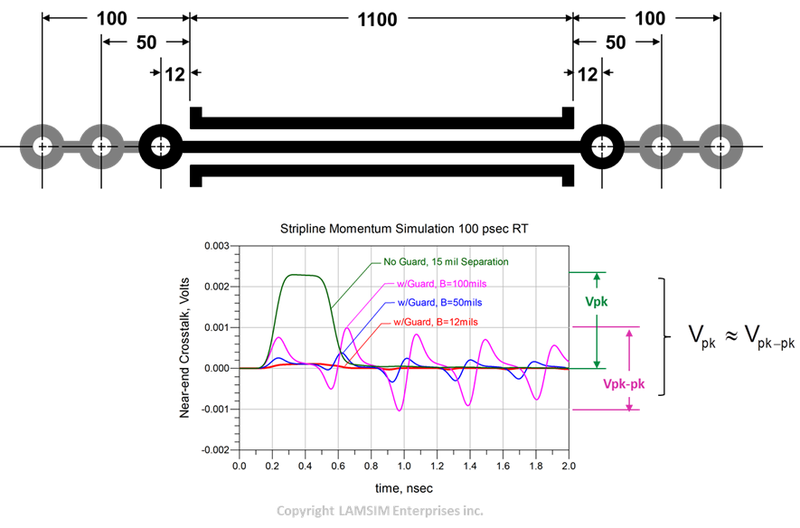 Since the couplers, at the far-end, are not terminated, in the characteristic impedance, and left open, any secondary reflections due to coupler via reflects back towards the receiver, again with opposite phase. When both reflections arrive back at the receiver, they will add together and add additional noise to the eye, causing inter-symbol interference, as shown by the shoulder in Figure 3(A). By leaving one end open, and shorting the other one to ground, means that any secondary noise will have the same phase, and when they arrive at the receiver, they will cancel, thereby eliminating the inter-symbol interference and increasing the eye amplitude as shown in Figure 3(B). You will notice that the eye waveforms do not resemble the traditional eye diagram we are used to seeing. Instead we observe a typical NEXT eye, when the coupled length is short, compared to the bit time. There is also a line right in the middle. Figure 4 can help to explain the reason. The blue waveform is the NEXT voltage, seen at the near-end of the coupler, in response to the red transmitted waveform. 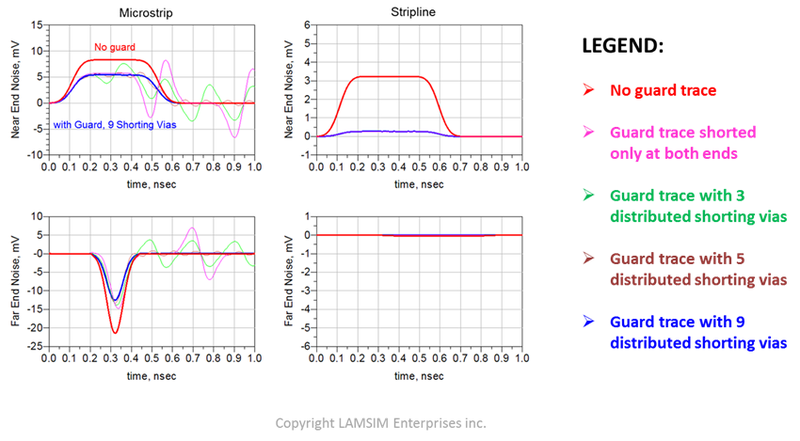 Notice that there are only pulses at an edge transition of the transmitted waveform. A rising edge creates a positive pulse, and a falling edge generates a negative pulse. The duration of each pulse is twice the time delay of the coupler length. The receiver uses simple peak-detectors and latch to regenerate the signal back to the original waveform. 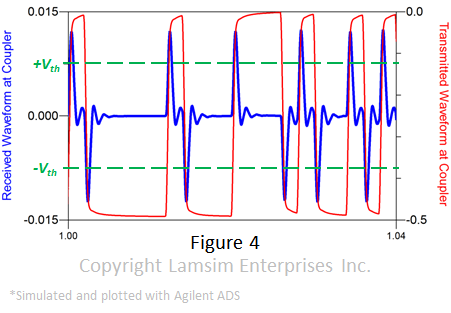 A positive going pulse is detected by the positive peak-detector. When it crosses the positive voltage threshold (+Vth), it sets the latch output to logic high. 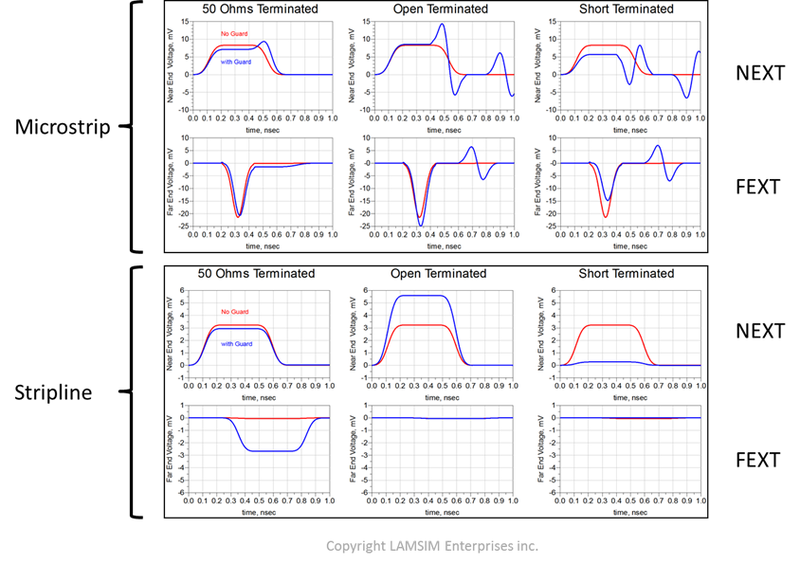 The output remains high until a negative pulse crosses the negative threshold (-Vth), of the negative peak-detector, and resets the latch to logic low. And that is how crosstalk can be your friend! Of course the small coupled crosstalk signal means we have to guard against CROSSTALK from other digital signals on board. But that’s nothing that mixed signal layout design rules can’t solve. ……Wait a minute! ……We both share the same enemy? …….. Who would have thought an old Proverb, “The enemy of my enemy is my friend” [sic], would apply here too? Alexandre Guterman, Robert J.Zani, “Point-to-Multipoint Gigabit Backplane Design”, IEEE International Symposium on EMC, May 11-16, 2003.